The Ottawa Coed Rec Soccer League was founded in the summer of 1992. We were founded on the philosophy of providing a venue where anyone who wanted to play soccer could. Operating both outdoor and indoor seasons we have had just under 2500 players kick a ball and score a goal or two during our first 27 years. Our games are refereed and provide certified referees for all regular season games. League organizers create the teams attempting to balance skill levels. There is an emphasis on fun, and not an emphasis on keeping score. Players are invited to meet up after games for social libations. We accept individual registration, couples, and small groups. We do not accept full team registrations. 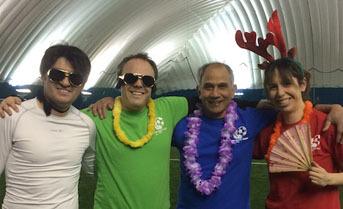 Winter and spring 7 vs 7 indoor games are played at the Coliseum dome located at the RA Centre, and summer 11 vs 11 outdoor games are played at Pinecrest and Centrepointe fields. See the locations page for details. Notices of registration will be sent out by email to those who subscribe and to our twitter account. We accept individual, couples and small groups, but we do not accept full team registrations. See registration for available seasons. Team captains are appointed to ensure that players play safely, fairly, and share the game equally with team members. They encourage players to play in different positions and learn new skills. Determine if additional substitutes are needed, if needed they can be co-opted from other teams. Captains will also be asked to bring their soccer kit to each game (ball, pump, pinnies for keepers, goalie gloves, first aid kit, and ice packs) as provided by the league. Ensure that teams don’t run up the score (3 goal differential).